Once in Santorini, try our wines as they are believed to be the best ones in Greece. You can have a glass of wine at a bar or at a restaurant, but this would be just the very beginning of your wine trip in course of time and history. Since Santorini has the oldest vineyards in Europe, or maybe even in the whole world, you realize that the island has much more to offer you in terms of good wine. We’ve got the unique flavours to satisfy even the most demanding customer! Special conditions of grapes’ growing - volcanic soil, lack of rains, high humidity at night and of course special varieties of grapes - contribute to the great taste of our wines. You can learn more interesting facts about them when you visit several wineries and a local vineyard during your Wine Tour. Our grapes have stayed untouched by Philoxera that destroyed the vineyards in many countries all over the world making the experience of wine tasting in Santorini even more surprising. Lately Santorinian wine producers introduce their products to the International Wine Competitions winning the highest prizes and Golden medals. The world gets to know the unique wines from our island and they are taking a special place in the hearts of all wine lovers. We can say that a glass per day keeps a doctor way as many cardiologists recommend a glass of a good red wine during your lunch to protect you from cardio disorders. Aside the great choice of excellent white wines Santorini is famous for we have very bright reds, what make real wine experts to appreciate our wine culture even more. The vineyards of Santorini are our national heritage. You can hear it once, read it many times but you’ve got to come here to live this exquisite wine experience. The grapes are being cultivated in Santorini in a very special way known in Greece as “kouloura”. Everything has to be done manually, yet taking into consideration our unique varieties, climate and weather conditions, all of that contribute to the cost of the grapes which is the highest in the whole country. Some of the members of your party or family may not drink but they will be impressed with our cave wineries and wine cellars, with the unusual way of growing grapes, and they will learn a lot about the grapes of Santorini, too. Natural pumice caves where we keep wines are the best for it as they allow preserving the same temperature during the whole year. Santorini has many private wineries contributing to a big variety of wines you can find in the island. Some of the wineries themselves are real masterpieces on their own. Discover the unusual architecture visiting one or several of them to get even greater experience from Santorini! We produce less wine than the number of visitors we have during the season. Therefore, it’s really hard to find a good wine from Santorini in other parts of Greece, and even in restaurants and supermarkets on the island itself. You can get the real idea of wine making in Santorini only after visiting several wine producers and getting acquainted with their precious product. Remember to smell each wine before tasting! To imagine better what our wine cellars have, here you will find more relevant information about the best wineries of the island, each of them in particular. Being one of the oldest wineries on the island Art Space is a proud best quality wine maker keeping the best traditions and using unique technologies. The owner, Mr. Antonis Argyros, takes extra care of his grapes and has invented a new method of their growing (based on traditional, of course) allowing to have a better quality of grapes and therefore to get the best wines ever. Biological, organic product is being processed without any chemicals and even pumps, with no filters, leaving the whole exquisite bouquet in your glass. Art Space has the smallest production of Santorini producing not more than 7.000 – 10.000 bottles per year which can be bought only from the winery itself. The museum part of this unique winery consists out of several premises built inside the caves. You will see the old traditional way of wine and moonshine (raki) making and visit the immense galleries with many works of art inside (paintings and sculpture mostly) presented by 26 Greek and international artists. Wines produced by Mr. Antonis Argyros exclusively out of his own organic grapes are highly appreciated by the World Wine Community. Most important printed and online travel and other Greek and International resources wrote their articles about Art Space: Lonely Planet, Michael Müller, Marco Polo, Matt Barrett’s blog, the Guardian, WikiTravel, Los Angeles Times, Daily Mail, Houston Chronicle, The Business Times Weekend and more. This winery has been announced one the best island wineries of the world, while its fantastic wine Saint August – one of the best wines of the world. Would you miss an opportunity to visit such a special place? Vinsanto - Naturally Sweet Wine. Variety: Assyrtiko 90-95%, aidani, athiri 5-10%. Different aging. A visit to Art Space is something you will remember as an extraordinary experience of Santorini. Art Space Winery and Gallery is open every day during the season, 11:00 – 19:00. Wine tasting: 5 Euros per person. Suitable for individuals and small parties. Gavalas Winery is one of the most characteristic private wineries of Santorini, with the owner dedicated to his wine production. The award of one of the Best Greek Wineries makes him proud seeing the result of his devotion to the best traditions of growing grapes and wine production in Santorini. The winery started working back in 19th century and since then it is constantly improving, enriching its assortment, achieving new goals and steadily going out to the International markets. Throughout the years of hard work we see obvious progress and change in the approach of how to attract more people to taste and to appreciate the best quality Santorinian wines. Lots of attention has been paid recently to public relations that definitely help to make Gavalas wines more recognizable in International market urging more and more customers to buy a bottle of that incredible wine they’ve tasted in Santorini or they’ve heard about from their friends. Young and passionate staff of Gavalas Winery contributes a lot to the recent rapidly increasing popularity of this wine maker. Have in mind that this is one of the few wineries where we bring our Top Top guests! Entering the winery you are already being intrigued by the setting. Passing through a narrow low corridor decorated with round-shaped old vines and different utensils from the previous ages you are being transferred in time back to those days when island was poor and wine making was essential for survival. The premises give you the feeling of a simple way of life, attractive though as something very different from what we know today. Gavalas used to produce wines only from the grapes grown in his own vineyards. At some point he was the main grapes’ supplier to another important winery of the island – Boutari. Two main features of Gavalas winery are: very high quality of the product and an incredible variety of wines made out of very rare kinds of grapes. Wine tasting: starting from 1,5 Euros per a glass of wine. Suitable for individuals and small-medium parties. Some of the most esteemed wines of Santorini are coming from Hatzidakis Winery. Everyone who knows this volcanic island very well shows great respect to this name and experience great enthusiasm finding Hatzidakis wines on a wine list in local restaurants. Usually these wines are being served at the most glamorous and expensive places of Santorini as a sign of a great quality, luxury and prestige. Hatzidakis family is widely known for cultivating grapes mostly organically. It cooperates on that matter with other biological wineries of the island trying to use the best of our traditions and experimenting with natural ways of grapes’ growing taking into consideration even the Moon phases. Mr. Haridimos Hatzidakis used to work as a promising oenologist at Boutari’s winery where they’ve met and later on started their own wine business recovering that half hectare of the vineyard that Mrs. Konstantina inherited. Hatzidakis Winery is open every day during the season, 10:00 – 19:00. Wine tasting: Euros per person. Koutsoyannopoulos Wine museum is number two on the list of Top 10 wine museums of the world and is on the list of the Best Wine-Themed Attractions in Europe. In fact it’s a unique underground premise located in a natural 300m long cave 8 meters down. The winery was established by two brothers who arrived in Santorini back in 1870 from Peloponnese. Since then they and their following generations have been contributing to the wine culture of the island. Walking in the caves of Koutsoyannopoulos Wine museum you discover the past of Santorini starting from 1600. Tools, utensils, huge old barrels, first bottled wines, explanations, documents, family photographs and animated scenes help you to understand how wine culture was developing on the island and what a great role it played in history and economy of Santorini. The museum is amazing and even small kids do not get bored there. In fact a visit to the Wine Museum is a must to get a much better idea what Santorinian wine is about. To make it easy going, the management of the museum created an audio guiding system in all the basic languages of the world that definitely helps to uncover the mysteries of wines made in the volcanic island of extraordinary beauty. The audio guides allow you to spend as much time in the museum as you wish, with no one to hurry you up. Being impressed by the whole underground kingdom of wine making you’ll proceed to wine tasting. Agali - White, Red Dry Wine. Lava - White, Rose, Red Dry Wine. Wine Museum is open every day during the season, 10:00 – 19:00. Entrance fee: 10,50 Euros per person (including wine tasting). Venetsanos differs a lot from the rest of the wineries. First of all, it offers a stunning view, being built on the top of the cliff, what made it also a popular wedding events’ location. It is conveniently located on the way towards the Southern part of the island. The winery itself is carved inside the rock in 4 levels and is an impressive sample of architecture. Originally it was founded in 1949, during the times when there was no electricity yet in the island. The owner had an ingenious idea of how to make gravitation work for him without too much effort in order to send the wines down to the port. This is what you see inside the winery – gravitation and natural inclination making the biggest part of the job. Venetsanos impresses its visitors by huge underground premises that you would not expect to see inside. Due to the long illness and death of its initial owner, George Venetsanos, it stayed closed for a long time and was re-opened just several years ago, when his nephews decided to continue his business and to add one more jewel to Santorini wine heritage. The winery has limited production and is not spreading its product through the shops or restaurants. Venetsanos Winery is open every day during the season, 10:00 – 21:00. Entrance fee: 2 Euros (guided tour). Wine tasting: 10 Euros per person. Boutari winery is one of biggest wine producers in Greece with initial vineyards and activity in Northern Greece area. In 1989 Boutari family opened a new winery in Santorini and since then was contributing to the fame of Santorinian wines all over the world. Boutaris vineyards are located in the Southern part of the island and cover a territory of 6 hectares. One of the particular features of the winery is that it gives you an opportunity to see its vines from close learning more about specific way of grapes’ growing in Santorini. The wine cellars of the family are rather impressive due to the big production. Winery has a big premise where one can enjoy wine tasting together with local appetizers. Boutari winery is settled in a modern building keeping some features of traditional architecture as well. Its whitewashed round shaped roof reminds you of anti-seismic structures we’ve been using in the island for centuries and up to nowadays as protection from the earthquakes. From 2017 a part of Boutari yards in Santorini is being used as the grounds for the unique and the most exciting activity in Santorini – hot air balloon rides, combined with Boutari wines’ tasting right afterwards! Vinsanto Boutari - White, Sweet Wine. Variety: 90% Αssyrtiko and 10% other local varieties, mainly Aidani. Wine tasting with a guided tour: 12 Euros per person. Estate Argyros is one of the esteemed wine producers of Santorini. In fact, it is an award winning winery (Wine and Spirits Top winery 2014) and is considered to be one of 100 best wineries in the world for 2005 and 2006. Originally Estate Argyros was established back in 1903 in Episkopi village and presented a simple but practical little wine plant with a small patio and entrance decorated with “kouloures” – the unique traditional “vine wreaths” of Santorini. Starting from 5 acres that the family owned initially, after 1950 Argyros vineyards grew up to 15 acres and after 1974, when the grandson took the Estate over, they expanded up to 65 acres. Argyros family can boast of very old vines and each generation is doing its best in terms of keeping the traditions and having very good quality of wines. Estate Argyros is trying to revive rare varieties that used to be the heritage of Santorini. The last move of the family was to increase its premises moving into a newly built space visible from the road towards Kamari. This brand new building is very modern and is decorated in the best traditions of minimalism. Estate Argyros is open every day during the season, Monday – Friday 08:00 – 20.00, Saturday 10:00 – 20:00. Wine tasting: from 8 Euros per person. Canava Roussos is the oldest winery in Santorini that was built back in 1836 in the area famous for its vineyards. It’s already the 5th generation that follows old traditions of wine making in Santorini and stands for organic production and protection of the vineyards. You can visit the old museum part to understand how wine used to be produced in the island in previous ages and to see the wine cellars. Further on you have an opportunity to taste local appetizers (mezedakia) in an open plan Canava tavern where traditional food is served together with excellent wines of Roussos Family. The place is located in a quiet rural neighborhood next to the vineyard. Roussos wines have high quality and exclusive taste. 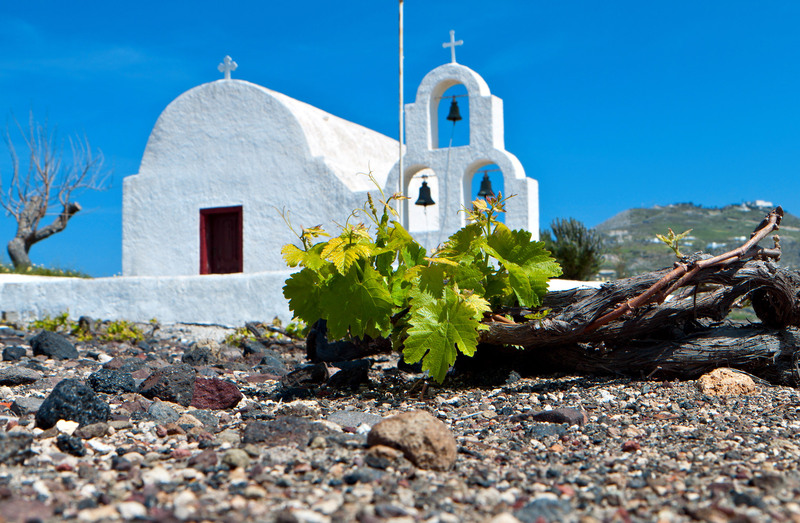 Canava Roussos is famous for its church wine Nama made in the best traditions of Santorini. Here you will also find surprising sweet red Mavrathiro. Canava Roussos is open every day during the season, 11:00 – 19.00. Wine tasting: from 2 to 6 Euros per glass (only aged wines). Domaine Sigalas is the only winery located very close to Oia. The area has the name of Baxedes where the grapes are growing since old times. This is a winery with a big production (for Santorini) exporting its wines abroad to Germany, France, Belgium, Austria, Holland, England, Cyprus, Switzerland, Hong-Kong, Shanghai, Sweden, Singapore, Australia, Brazil, USA and Canada. Main varieties that Sigalas Winery is using in its production are Assyrtiko, Aidani, Athiri, Mandilaria and Mavrotragano. An interesting feature of this winery is its tasting room located in the middle of the vineyard and allowing up to 50 guests. Domaine Sigalas is working since 1991 and is a winner of many awards in International Wine Competitions. Sigalas wines are being appreciated by many Greek and foreign oenologists. Wine tasting: from 1 Euro per glass. Santo Wines is the biggest winery in Santorini. It is a cooperative of winemakers having more than 1000 members. Santo Wines is very popular among the tourists, especially those arriving from the States, India and China. The Winery has a fantastic view on Caldera, the Cliffside and the Volcano of Nea Kameni and therefore is a favourite place of our visitors. Many couples are coming here to watch one of the most magic sunsets you can find in Santorini sipping a glass of wine and eating your dessert. First opened in 1992, now it is a modern winery applying new technologies in wine making. Entering the winery you will be impressed by an old huge wine press and then further on will see an 800 years old olive tree located in the middle part of a “reception” area. Here in little terraces, you can fee famous traditional products of Santorini growing: Santorini sweet cherry tomatoes, white eggplants, capers and different herbs. Santo Wines offers several terraces for wine tasting accompanied by the snacks and sweets enjoying the incredible views and the sunset. There is also a big premise inside with big panoramic windows and the walls decorated with a big number of awards their wines won in different wine competitions. Santo Wines is also a famous place to arrange your wedding or to make a wedding proposal due to its unique location and beautiful surroundings. Annual Vedema (local wine festival) takes place here when the proud members of the cooperative gather together to signify the beginning of the grapes’ gathering. Everyone is invited! Santo Wines is open every day during the season, 10:00 – 23.00. Wine tasting: 20 Euros per person.